Flowmaster Delta Force Air Intake Pre-Filter Wrap UNIVERSAL - Dezod Motorsports Inc - Home of the automotive performance enthusiast since 2002. Our new Delta Force Pre-filter wraps are designed to act as an added layer of protection from dirt and dust particles aiding in extending the life of your Delta Force air filter while extending the maintanance intervals between washings. Easy to clean and reuseable, this pre-filter requires no oil to capture dirt and dust and works on gas and diesel engines. 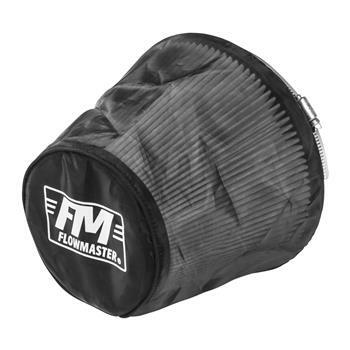 Comes with the Flowmaster FM logo printed on the face of the filter.